Part of a series on building the bilingual teacher pipeline. Read the profile of Highline Public Schools and Western Washington University's bilingual teacher fellows program here. At the start of the 2015–16 school year, the dual language immersion and world language programs at Portland Public Schools (PPS) were in a precarious situation. The district, which has offered bilingual instruction for several decades, was undertaking an ambitious expansion of these offerings as part of a larger effort to increase equity and close long-standing achievement gaps. However, with expanding dual language immersion programs in neighboring districts and small numbers of bilingual candidates graduating from Oregon’s teacher preparation programs, there was a dearth of educators to support the model. The district had been unable to fill 14 teacher vacancies and scrambled to adjust program models in some schools to cover the staffing gaps. It was clear that district administrators needed to take action to ensure that their dual language immersion programs had the staff they needed. 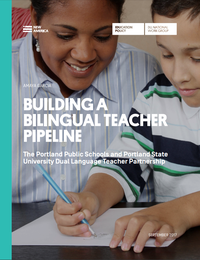 In summer 2016, the district, in partnership with Portland State University (PSU), launched two cohorts of the PPS & PSU Dual Language Teacher Partnership. The partnership provides 28 dual language teacher fellows with the opportunity to earn a master’s degree in elementary education with a bilingual/English to Speakers of Other Languages (ESOL) endorsement or in secondary education with a world language endorsement (e.g., Spanish) while they simultaneously work as classroom teachers, full-time substitutes, or paraprofessionals. Each bilingual fellow underwent a multi-step process to join the program, including gaining admission into PSU and into the teacher preparation program (either Bilingual Teacher Pathway or Graduate Teacher Education Program) and getting hired by the school district. These candidates were drawn from both existing staff (e.g., paraprofessionals) and the local community. “The whole premise of this [program] was the belief that we had already tomorrow’s teachers...in our community. We just have to identify them and equip them,” Debbie Armendariz, senior director of Dual Language Immersion at PPS, told us. This program is the first in Oregon to leverage a school district/university partnership to build a alternative certification bilingual educator pathway that allows participants to work as classroom teachers (and earn a teacher’s salary) while pursuing an education degree and licensure. The PPS/PSU program is one example of how states and districts are addressing the need for qualified bilingual educators through alternative pathways designed to help them grow their own talent.